If there’s one thing about math that people love—and to make it through the average day, I have to believe there’s at least one—it’s infinity. Infinity is a sound too high for our ears, a light too bright for our eyes, a taste so sweet that it would tear through our tongues like acid. Basically, it’s mathematical Mountain Dew. Tellingly, all of our words for infinity define it by what it isn’t. Infinite: not finite. Unlimited: not limited. Boundless: without bounds. It’s hard to articulate what infinity does, so we settle for naming what it doesn’t: end. Infinity is the Anansi of mathematics, a trickster spider weaving baffling webs of paradox and contradiction. Take this example: which has more numbers, List A or List B? Well, they’re both continue forever, so they’re both infinite. But the first list includes every number on the second (2, 4, 6, 8…), and lots more as well (1, 3, 5, 7…). Thus, clearly, List A is the bigger group of numbers. Right? Wrong. The lists are exactly the same size. Now, doubling each number shouldn’t affect the size of the list. We haven’t added any items, or taken any way. It’s like taking a group of people and giving them fake beards—you don’t create or destroy any humans in the process. And yet… without changing its size, we’ve somehow turned list A into list B. That can only mean that the two lists were the same size to begin with. What’s happening here? Throughout our lives, we’ve relied on a simple rule for comparing the sizes of groups: If one group has all the members of another, plus some others, then it must be bigger. For example, if your list of Facebook friends includes all of mine, plus you’re friends with Kanye West, then you have more friends than I do (and probably cooler weekend plans, too). And that’s perfectly true, for finite groups. But infinite groups… those are another matter. Infinity shreds our intuitions. 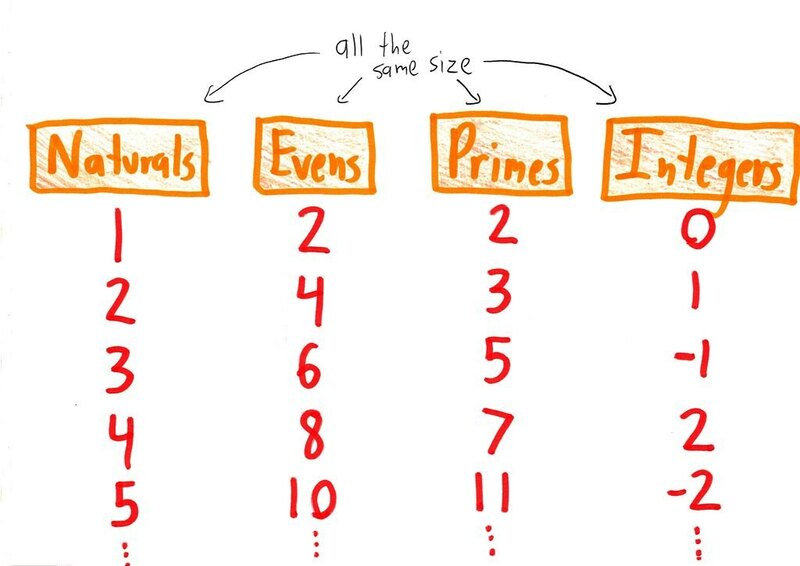 The startling truth is that all infinite lists are the same size, regardless of whether one happens to include the other. You show up, asking for a room. 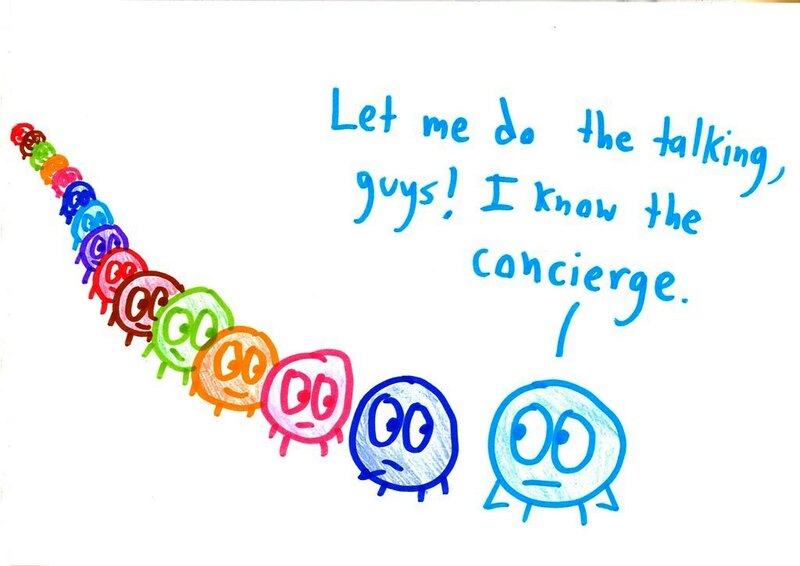 “Sorry, they’re all occupied,” says the innkeeper—who’s probably a little frazzled, what with the infinite calls for room service coming in. It’s true. The person in Room 1 goes to Room 2. The person in Room 2 goes to Room 3. The person in Room 136,004 goes to Room 136,005. And so on. Everybody has someplace to go. Now, whether it’s good manners to show up at a hotel and demand that a literally infinite number of people suffer a minor inconvenience just so you can avoid trying the Best Western down the road—that’s another matter. You’re probably a bad person for making this request. But you’re a fine mathematician. Can we do this without inconveniencing an infinite number of people? Unfortunately, no. For example, if you take Room 1, and send that guy packing, he’s going to have the same problem as you: every room is now occupied. As long as you’re shuffling a finite number of rooms, normal math applies, and somebody will be left out. Your infinite problem demands an infinite solution. It gets crazier. What if you’re coming straight from the Infinite Man March, and you’ve got an infinite line of new friends in tow? Can the hotel hold you all now? 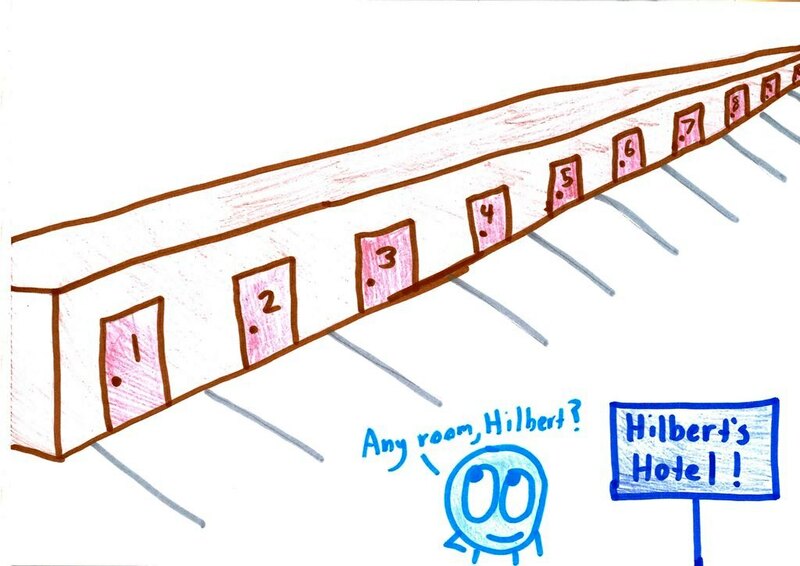 This time, each current guest needs to look at their room number, double it, and move to that doubled room. So the chap in Room 1 moves to Room 2. The gal in Room 2 moves to Room 4. The fellow in Room 3003 moves to room 6006. And so on. At this point, which rooms are filled? Only the evens. So you and your infinity friends fill the odd rooms, and voila! Problem solved. At this point, infinity is perhaps beginning to feel like a squishy, flexible, silly-putty sort of idea. Infinite lists? They’re the same size. Infinity plus one? Still the same size. Infinity plus another infinity? Yup, still the same size. It raises the provocative question: Are all infinities the same size? Tune in next week for the answer. Oh, who am I kidding? The answer is no. Some infinities are much bigger than others. Tune in next week for why. I’ve always felt that size is not an attribute of infinite sets. If you measure the size of something with a ruler, how do you decided which number on the ruler corresponds to the object’s size? You read off the one that is where the object ends. Size is a limit measurement–something that doesn’t have a limit doesn’t have a size. Yeah, our definition of “size” for infinite sets certainly isn’t the same as our definition for finite sets. I’d go so far as to call this a theme in math – taking an ordinary word and stretching it to fit a new setting or scenario, losing some of its original meaning in the process. Perhaps always putting “size” in quotation marks better captures the meaning here. I am hopeful that the Continuum Hypothesis (or its negation) can find its way into a “bad drawing”! I do hope you get as far as the Cantor Middle Third set. This is really mind blowing. Not nearly as mind-blowing as the Cantor middle-quarter set: totally disconnected, nowhere dense, contains no intervals, and yet has positive measure. Now here’s a puzzle: can a set of real numbers be constructed which has positive measure on every interval, but full measure on no interval? Ok, the irrational numbers are uncountable, but unfortunately the set of algebraic numbers is countable, and this includes all square roots, cube roots, etc. A great article that even middle schoolers can get a grasp on to begin to understand this concept. This doesn’t quite work. See Ben’s next post. It actually does! An infinite set can’t necessarily be placed in one-to-one correspondence with ALL of its proper subsets, but it can with at least one of them. Thanks. I clearly didn’t do a “close reading” here! The term for this is Dedekind-infinite (see also: Dedekind-finite). With the Axiom of Choice, it syncs up with the standard definition of infinite. I’m not a fan of using the word “Wrong” in reply to “List A is bigger than List B”, for the simple reason that there are several common and useful definitions of “size”, some of which do indeed say List A is bigger than List B. In addition to cardinality, there is set containment, measure theory, sub-group/ring/field relations, and plenty of other partial orders which formalize various aspects of bigness. Not all of them apply to lists of integers, but another one that does is the concept of natural density. Cardinality may say the integers are equinumerous with the evens, but set containment and natural density both aver that the former outnumber the latter. That’s two against one, and last I checked two is bigger than one by a factor of, like, six. The equivalence you mention doesn’t even require all of countable choice, let alone the full axiom of choice. In fact “Dedekind-infinite implies infinite” is true without any form of choice, and “infinite implies Dedekind-infinite” is equivalent to “every infinite set has a countable subset”. I only wished to indicate that the two notions of infinitude need not be equivalent in a model of ZF, whereas they are equivalent in any model of ZFC. That is one direction, yes. For the converse, given a Dedekind-infinite set S, let f be a bijection from S to its proper subset T. Take x in S but not in T, and the orbit of x under f never hits the same value twice (proof left as an exercise) so it is a countably-infinite subset of S.
He can’t move into room 1 until the guy in room 1 moves into room 2. 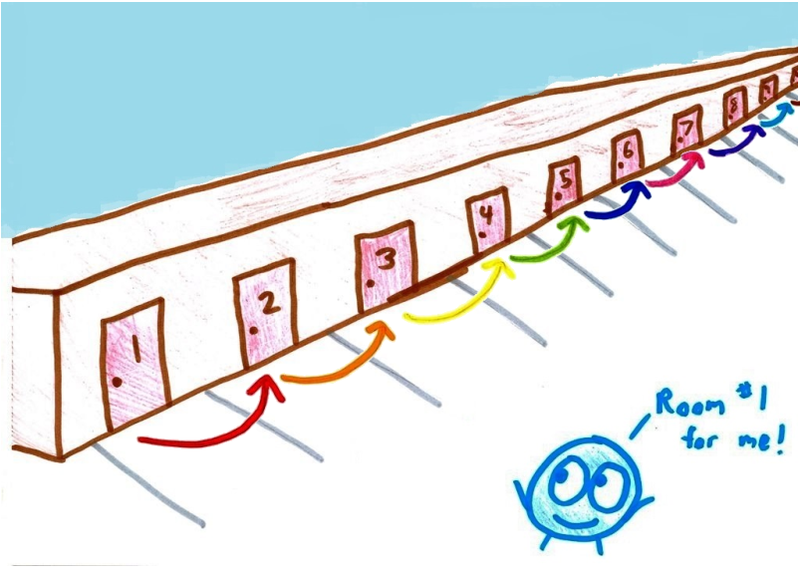 The guy in room 2 can’t move into room 3 until the guy in room 3 moves into room 4. 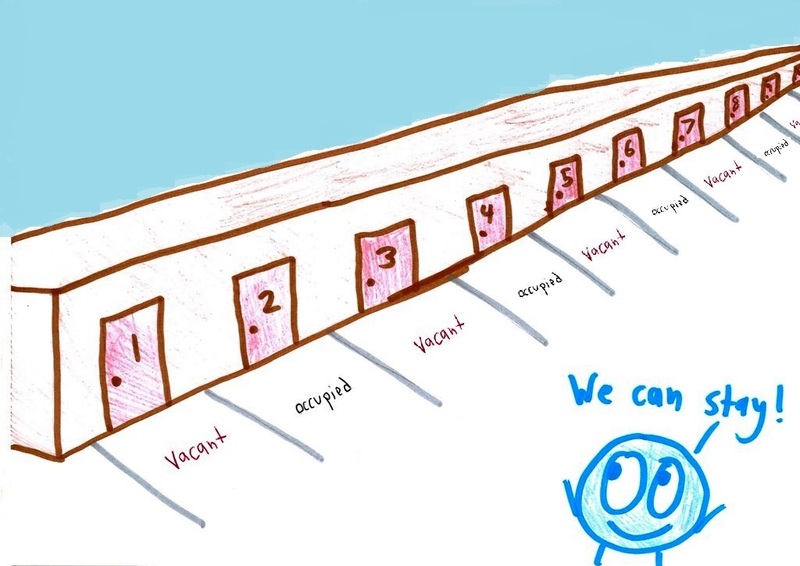 The guy in room 3 can’t move into room 4 until the guy in room 5 moves into room 6. And so forth. So when will room 1 be available? Aren’t all these guys waiting on the next room to open up for them?